Built by Robertson & Caine and designed by Alexander Simonis, the Lion 46 was at the front of the power catamaran movement emphasizing comfortable, efficient cruising with exceptional usage of space over thee decks. Taking the efficiencies created by the power catamaran design even further, the current owner installed foils to add additional lift, performance and efficiencies to this hull. With Marebe's many upgrades she offers fantastic value on today's market. 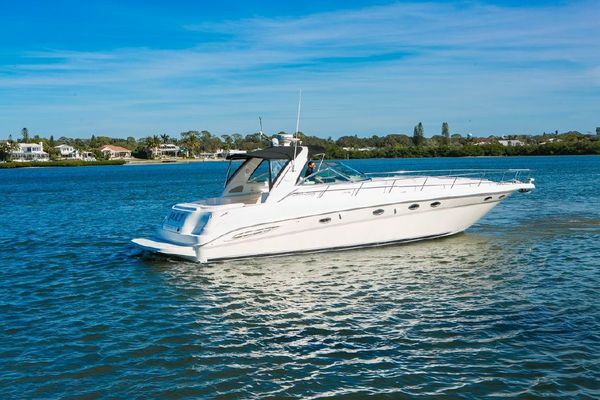 West Florida Yachts would love to guide you through a personal showing of this 46' Lion 46 2003. This yacht for sale is located in Dennis, Massachusetts and priced at $225,000. For a showing please contact us by filling out the form on this page and we will get back to you shortly! Returning the wingbridge cockpit you enter the salon/pilot salon through the sliding door. As you enter this salon, the aisle galley runs along the port side facing outboard ending at the companionway steps that access the lower cabins to port. Forward of the companionways on the wingbridge is a double settee to port and the internal helm station to starboard. Turning back to the transom to starboard in the semi circular dinette with wood table and upholstered seating. Turning aft to starboard is the wrap around upholstered salon seating with wood dining table. Centrally located opposite the galley and just inside the sliding doors, this area has exception views to port, aft and forward. Twin Yanmar 6LY3X1 370HP turbo diesel engines Electrically operated hatches for engine access with steel steps down to engine room. Ample space around each engine is provided for maintenance and cleaning. Engine instrumentation includes oil pressure, tachometer, water temperature, hour meter, and amp meter. Engine sound alarm to indicate low oil pressure and high freshwater temperature. 'Water in fuel' alarm FloScan fuel flow meter at pilothouse steering station monitors fuel consumption. Electric oil change system Engine controls are electronic, providing a more responsive control over the engines than conventional cable systems. Keyless ignition switch in cockpit Electronic engine shut-off Dual station, single lever engine controls mounted at fly bridge and below deck steering station. Steering is hydraulic, power assisted by the port engine. Fuel capacity is 365gal. /1382L in two aluminum tanks. Racor 1000 fuel filters on each engine. 90 amp alternators on each engine. Two four-blade, 22" / 56cm diameter propellers. Telmet 25 stainless steel propeller shaft, designed for easy removal, with mechanical seal by Manecraft. ZF Hurth HSW800 "V" gearbox. Multi-channel VHF radio with LCD display and remote handset at fly bridge steering station. Color chart plotter with GPS navigation system inside with repeater at fly bridge steering station. Navigation instruments including depth sounder gauge, speed and distance log at inside steering station, with repeaters at fly bridge steering station. Autopilot at inside steering station with repeater at fly bridge steering station. While the boat was designed with a mirror image 2-cabin/2-head layouts on port and starboard side, Marebe has been slightly modified on the port hull. The starboard hull is for the most part the mirror image of the port hull with the exception that the aft cabin does not convert to an office.